If you have an interest in my art work , I have just consigned 3 of my original oil on linen paintings to Books with a’Peal in Cornelia, Ga. Thanks to Glenda Boiling owner of the business for letting me display. Her store address is: 401 Cornelia Plaza Dr. (one business down from the US post office) . Phone 706-778-4563. Stop by and Glenda will give you a showing of my work. Thanks. This is one of the most memorable memories from my childhood. Our family owned and operated a small country store and service station back in the 1950’s in a town called Cornelia, Ga. All 6 children worked at sometime in their growing up years. As soon as you could stock shelves, etc. your job started. This painting depicts a day that I was working by myself in the store. A nice young woman came in and looked quiet awhile at items . After sometime, I asked her if I could help her. She politely said, No, I’m just looking. Well, she got to the point where she could not find the product and asked me where was the KOTEX located. At first, I couldn’t locate it either ( but I knew I had seen that word somewhere ). Then, I politely asked her what was it used for. Almost instantly she spotted it and said quickly OH, I see it now! I was still puzzled about the product, but as I learned later the purpose of Kotex, it was easier for her that she didn’t have to explain it to this dumb kid !!!!! Years ago in the Northeast Ga. mountains fruit stands could be seen in lots of places, in towns, on the main highways etc. This painting shows one of the more unique stands that I remember. It was located in a small town called Baldwin. As the tv folks say ( according to my sources ( Bill Chandler )it was built long ago by Dr. William Chandler . First used as a filling station . Overtime it housed lots of other businesses including a fruit stand. It was torn down a few years ago and no longer exist. Vanishing history of another time ! This a tribute painting to a group of what I call “old time doctors “. A long time, good friend ( Bill Chandler ) shared this memory of his grandfather Dr. William Vance Chandler. He passed away at the age of 84 yrs in 1954. His early career started in the early part of the 20th century. Not only did he practice medicine from an office, he also carried his office all over his area. Dr. Chandler would hitch up his buggy and hit the road. Even with the advent of automobiles , he still at times would visit the sick using his horse and buggy. Roads in some areas were rough , rough. A hard way to make a living sometimes, but they carried on the best they could do. This painting shows a typical type scene I am sure he saw many times in his life time. Thanks to these type of dedicated servants of the people. 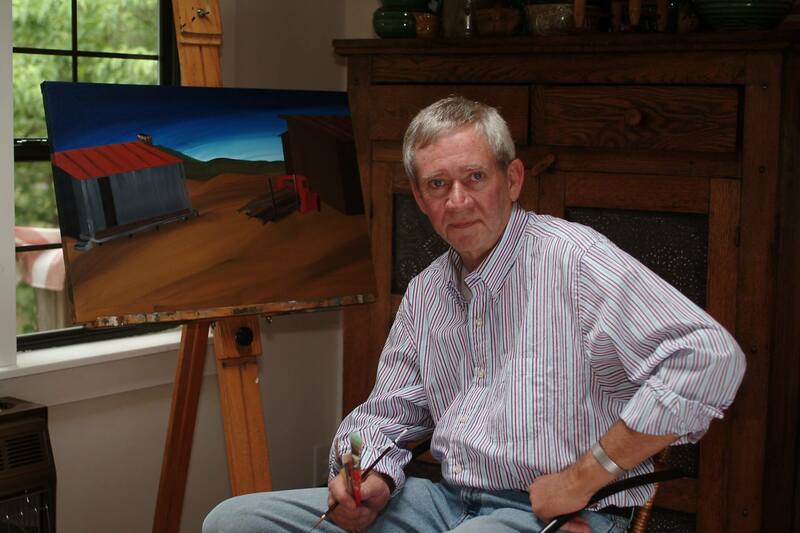 This photo of my painting “PA WRIGHT, OLD BLUE and RED” will be displayed at the inaugural “Art of GA” exhibit at the Georgia State Capitol in Atlanta beginning August 27 thru Jan 25, 2013. I presented the painting to Governor Nathan Deal on August 23, 2012. Recently I delivered a commissioned painting for Dr. Suephy Chen, Associated Professor, Vice Chair Department of Dermatology, Emory University Windship Cancer Center. Painting depicts the great care that I received from Dr. Chen and her staff. Great center, great people, excellent care. Great group of people whom I will always be indebted. Thanks for the opportunity to do this painting.